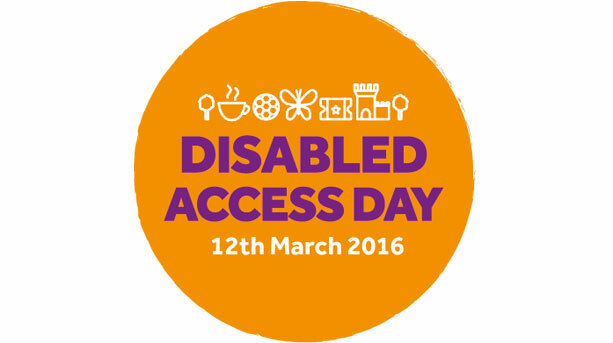 Disabled Access Day 2016 – save the date! Disabled Access Day, the annual national initiative created to raise awareness of the importance of disabled access, is back for its second year on 12th March 2016. The event aims to encourage disabled people, their friends and families to visit somewhere new and over 50 venues across the UK, including Westminster Abbey, Tate Modern and The Scottish Parliament, have already signed up with almost six months still to go until the day. Today, Disabled Access Day 2016 will be launched at the Royal Botanic Garden Edinburgh with Maureen Watt MSP, Minister for Public Health, in attendance. This will mark the beginning of the lead up to the second annual event, building on the fantastic result of 2015 which saw over 200 companies and venues taking part, including VisitScotland, BT, Caffè Nero, Caffé Concerto and Barclays and attracted over 1,000 disabled people and their families, friends and carers. An overwhelming 94% of disabled people would revisit a venue that has good accessibility, according to a survey carried out by Euan’s Guide the main sponsors of Disabled Access Day. With the UK’s 12 million disabled people estimated to have a combined spending power of over £200 billion, venues with poor disabled access or information are potentially missing out on gaining a significant amount of revenue. Fergus Ewing MSP, Minister for Business Energy and Tourism, said: “The Scottish Government remains fully committed to ensuring that everyone should have a chance to enjoy all that Scotland has to offer. That is why I am delighted to be here today to launch the Disabled Access Day – an initiative that continues to position Scotland as a country with world-class tourism facilities, offering more choice as well as excellent customer service.